Dancing begins when women are brave. A man can almost never begin the dancing. Women dancing alone, or with one friend, might be weird or need to claim they are drunk, but men dancing alone have to be drag queens or rock stars. Ideally, two or three women will begin the dancing. One woman dancing alone looks like she might start screaming at the gods (virgin) or taking her clothes off (whore). The starter women form a sort of triangle. As they dance, they occasionally make eye contact and laugh casually to sustain a casual group dynamic. It is now safe for anyone to begin dancing. The ladies have put on their oxygen masks. Some DJs try to begin the dancing with slow songs, forcing people who aren’t even warmed up to get in front of a crowd. This sad situation occurs at most weddings. At one point in my life, I became quite spoiled because my regular DJ carefully paced his records. He kept the floor full all night. He would never throw a “sit-down” song right after a great one. Never a song with an awkward tempo, one too slow or too fast to dance to! Never a song with odd breaks in it that interrupts the steady beat necessary for informal group dancing! A DJ may clumsily skip or scratch in a song, trying to make himself sound cool, but this disrupts everyone’s dance. Ugh. On the other hand, if there’s an emergency, let’s say someone’s about to have a heart attack, or the room is on fire, the crowd needs to stop dancing. “Brass Monkey,” even though it’s a Beastie Boys song, is appropriate for this situation. “Baby Got Back” may be another good choice, unless it’s really late and/or they are really drunk. The best songs for forcing dance are “Shake Your Body Down to the Ground,” “Wanna Be Startin Something,” or, if you want to go earlier, “ABC” or “I Want You Back.” Yes, all by our late friend Michael Jackson. People like to dance to those songs. White people, black people, brown people, young people, old people, nerds, hipsters, hippies, lawyers, Baptists (! ), the straight, the gay, Americans, Nigerians, Australians, the fresh bar/t mitzvahs, Republicans, the Montagues, the Capulets– I’ve seen them all. Except British people. They don’t dance. For people who don’t usually dance, it may be necessary to play a song with directions. I’m not a fan of being told what to do. “YMCA” is okay, though. Great-grandmas can and do enjoy performing it. The chicken dance and the Electric Slide are acceptable, but after three rounds of the Slide, I am dizzy. All right, so people are dancing. It’s time to make your move. How to dance with a pretty girl: first, dance with the group, show that you can and will dance. Next: adjust the space so that you and the woman are sort of dancing together, but can dance away if either party loses interest. Finally, attempt the dancing that involves touching of hands, then other areas that might interest you, progressing with assertive steadiness. I will dance with any man, no matter how short or hideous, if he’s a good dancer. And if I like him, I will dance with him, no matter how bad a dancer he is. Good luck. Just as there is a proper way to make a martini, drive a stick, and knead bread, there is a proper way to build a dance. 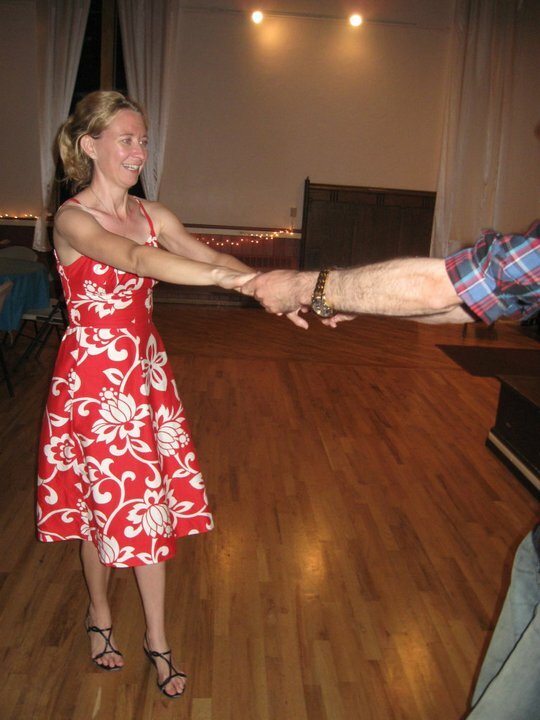 Be a helpful, contributing dancer to a dance floor near you. Feel free to act the fool within these guidelines! Relish it! Dancing is a sacred ritual designed to build community, offer a structure for mating, and scare away demons. Its success depends on you.